63’ 2" x 51’ 9"
The Vandiver does not skimp on space: four bedrooms, three baths, a three car garage, and one of the largest outdoor lanai patios you will encounter in a Palm Coast custom home. We find this model also stands out because of its split plan design with ten foot ceilings, separate living and family rooms, and very large closet in master suite. The façade of the Vandiver is striking, with several peaks on the roof. The walk-in closet of the master suite is an oversized dressing room, with a large window. The master bath offers its owners double sinks and a lovely light-filled garden tub beneath another window. If your lot is large enough, we recommend the three car garage of the Vandiver model: a Florida home that will never feel cluttered or crowded. 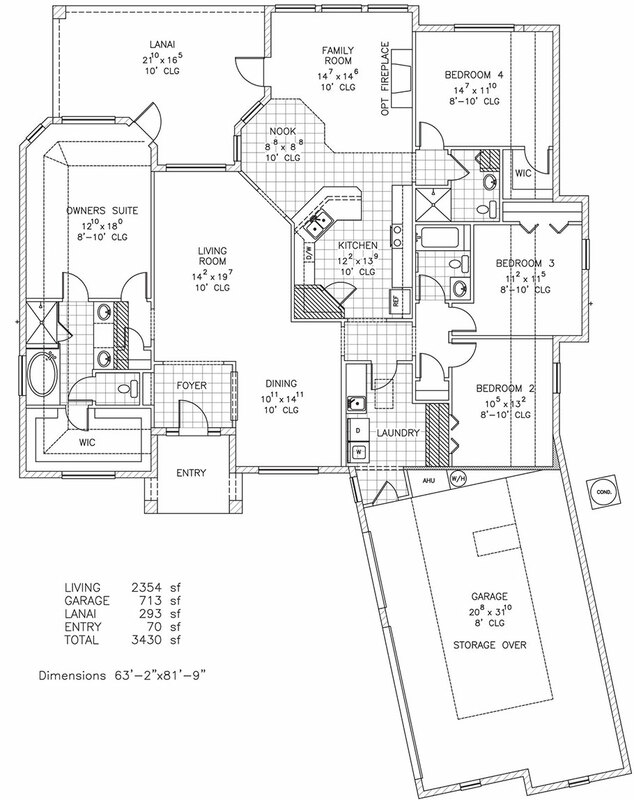 This floor plan is an artist's conception and may vary from the completed product. Dimensions are approximate and subject to change. Some options may be shown which are not included in the base price.